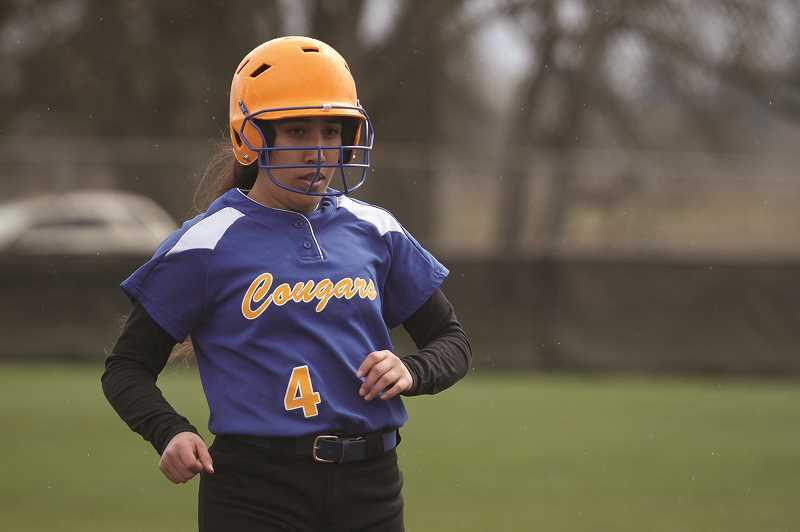 The Gervais Cougars split its home series against the Blanchet Catholic Cavaliers on March 27 to finish the bulk of its non-league schedule as the team prepares to enter league play this week. Gervais (2-5) was unable to keep up with the Cavaliers in the opening game of the series, falling 12-1 in five innings of play. After the Cavs took a 2-0 lead after the first two innings, they poured on five more runs in the fourth to take a 7-0 lead. Gervais took one back in the bottom of the frame when Veronica Esquivel's pop fly was misplayed, allowing sophomore teammate Alexa Rutledge to score on the play. But Blanchet got the run back and then some in the top of the fifth, scoring five more to bring the game to its final margin of victory. The Cougars got one back in the second game, rallying from a 6-2 deficit to score five unanswered runs in the final three innings to pick up a 7-6 victory and snap a four-game losing streak. The Cavs opened the game with a pair of runs against Gervais starter Marisol Ayala, but the Cougars answered back in the bottom half when Abigail Saalfeld scored on a fielder's choice by teammate Regina Vargas. Vargas scored on the next at bat, stealing second and then running home on an errant throw by the Blanchet catcher. The Cavs dropped four runs in the top of the third, but Gervais slowly inched its way back into the game. Rutledge scored on a throwing error in the fourth to pull the Cougars within 6-3, and Lex Luna hit a triple to drive in Sarah Saalfeld in the fifth to make it 6-4. Vargas followed with a line drive single to left field to score Luna pull Gervais within one run. The Cougars took the lead for good on a triple by Abigail Saalfeld, driving in teammates Natali Barrera and Ayala. Ayala pitched a complete game to earn the win, striking out eight and giving up three hits and three earned runs. Abigail Saalfeld led the team offensively, going 2-for-4 with a triple, two RBIs and a run scored. Vargas was 1-for-3 with a triple, two RBIs and a run scored. After a 17-days between games, the Trojans finally got back on the field last week, splitting a pair of road games hosted at Toledo High School. Kennedy (1-3) opened the day with a 6-5 loss to the Dayton Pirates — the second consecutive one-run loss to Dayton this season — but followed with a 2-1 victory against the hosting Boomers in the second game. The Trojans played the role of the home team in the game against Dayton, taking a 1-0 lead in the opening inning when Sophia Carley drew four straight balls with bases loaded to bring in a run. The two teams remained scoreless for the next three innings before the Pirates tagged a pair of runs against starting pitcher Grace Schaecher to take a 2-1 lead. The Trojans answered back in the bottom of the fifth when Emily Cuff hit a bases loaded line drive to center field, bringing in Elise Suing and Lydia Berning to retake the lead. Three batters later with the bases juiced once again, Rylie Newton Doubled to left field, bringing home Cuff and Ellie Cantu to give Kennedy a 5-2 lead. After a scoreless sixth, Dayton rallied in the top of the seventh, tagging Cuff in relief for three runs to take a 6-5 lead. The Trojans were unable to rally in the bottom of the inning, recording three straight outs to end the game. Schaecher struck out nine batters in six innings in the start, while Newton led the team offensively, going 2-for-3 with a pair of RBIs. Schaecher took the mound for the second game of the day, pitching a complete game and holding the Boomers to just four hits while striking out five. Kennedy scored its only runs of the game in the top of the fifth when Berning and Suing recorded back-to-back RBIs. Toledo took one back in the bottom of the frame to make it a 2-1 game, which held throughout the last two innings.